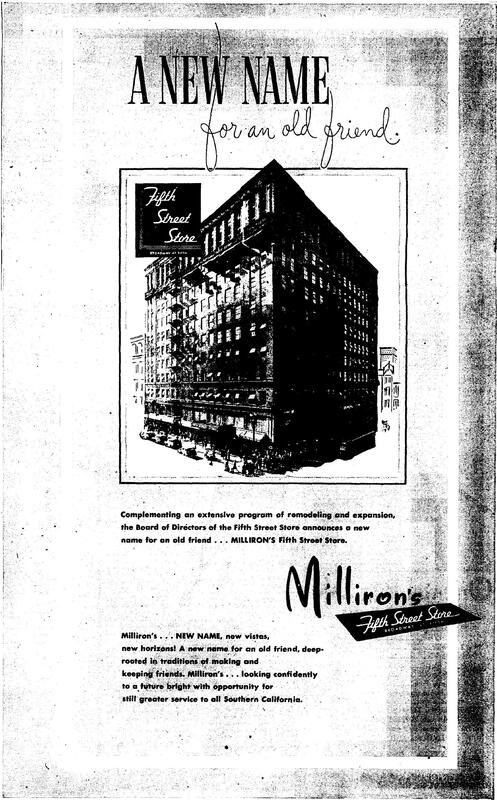 On May 7, 1946, owners of The Fifth Street Store department store on the southwest corner of Fifth and Broadway announced that it had a new name: Milliron’s.The Fifth Street Store opened on this corner in 1905 as “Faris, Steele & Walker,” after founders Ralf Marc Walker, W.A. Faris and D.H. Steele. The partnership shifted members over time and the store was soon generally known as the Fifth Street Store. In March 1917 plans for a new 8-story building to replace the existing 5-story structure on the site were revealed, but nothing came of it- possibly due to the U.S. involvement World War I. Plans for the Fifth Street Store’s new 8-story building that never materialized. LAT 3-30-1917. 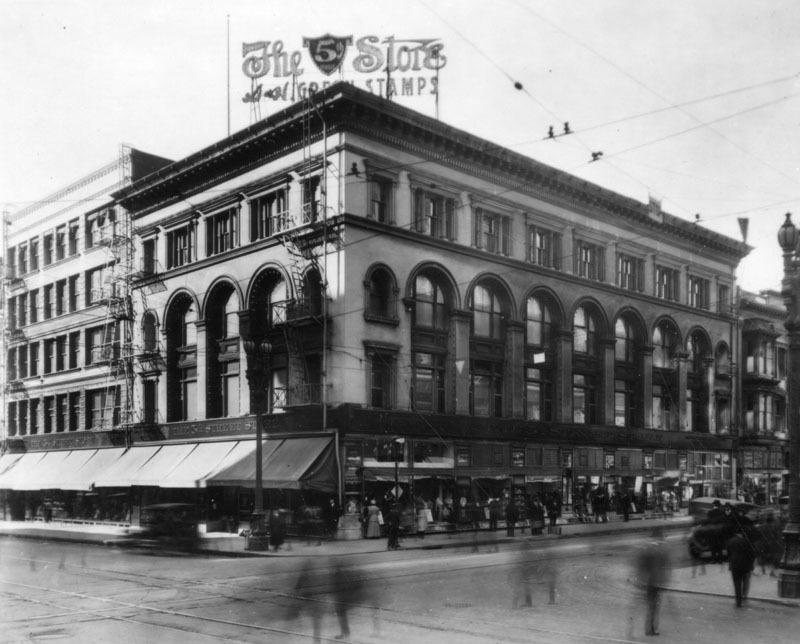 The Fifth Street Store on the southwest corner of Fifth and Broadway, c. 1920. LAPL. Finally, plans were anounced in April 1921 for a height-limit building, designed by Aleck E. Curlett, to be built in stages so the store could remain open during construction. The new building was completed by 1924 when Faris left the partnership. 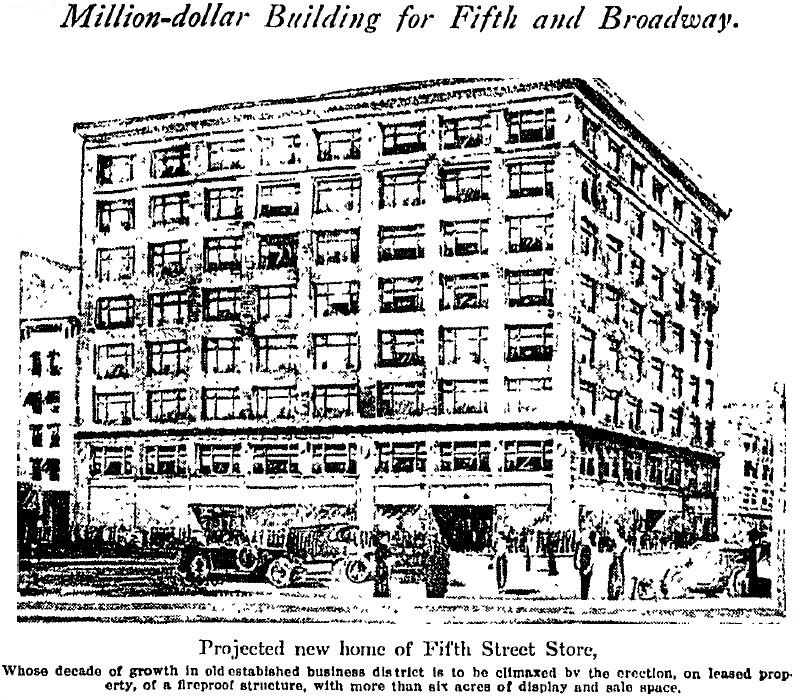 As of 1925 it advertised as Walker’s Fifth Street Store. Walker’s Fifth Street Store in 1928. Although customer’s likely didn’t notice any difference, Walker’s quietly went bankrupt in December 1934. Negotiations behind the scenes took place that enabled at least 700 workers to keep their jobs and the store to continue in business as the Fifth Street Store. But the strain was telling; Ralf Marc Walker passed away suddenly during a buying trip in August 1935. William A. Faris came back to take the helm again in 1937, the same year that C.J. Milliron acquired an interest in the store. Faris served as president until shortly before his own death in October 1944. “A new name for an old friend.” The Fifth Street Store becomes Milliron’s Fifth Street Store. LAT 5-7-1946. Detail of the remodeled and renamed Fifth Street Store, now Milliron’s c. 1946. LAPL. In December 1946, Milliron’s announced that it would build another L.A. store, on Sepulveda Boulevard in the Westchester area. Faced with the same building restrictions and materials shortages as other construction projects, the ground breaking for the venture wasn’t until March 1948. The store opened in March 1949. 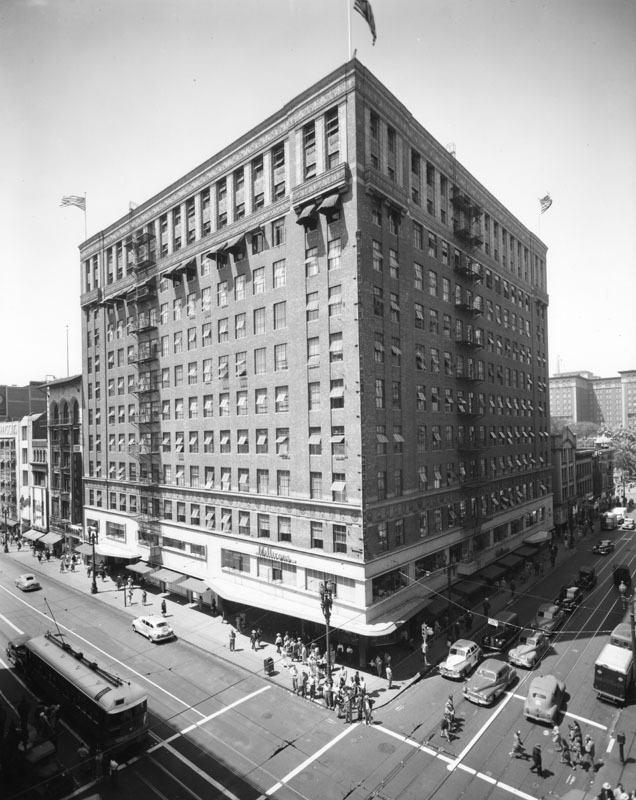 In June 1950 this location (the Sepulveda store only) was purchased by The Broadway chain. October 1952: Milliron’s celebrates an anniversary at the Fifth Street store with a cake and Richard Arlen. Also to mark the occasion some lucky couples married October 15, 1905 (date the Fifth Street Store was founded) received a free trip to Wilbur Clark’s Desert Inn in Las Vegas. LAT 10-14-1952. 1952 was to be the last anniversary for the Fifth Street Store or Milliron’s. In August 1953, they were bought out by Ohrback’s, a relative newcomer to Los Angeles with one store on Wilshire Boulevard, which opened in 1948. 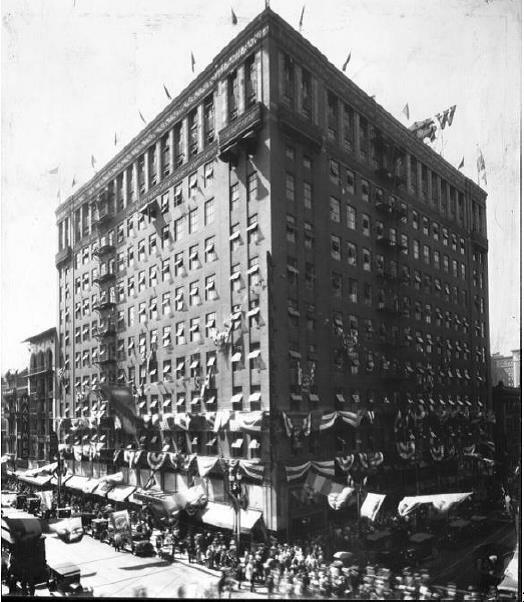 In November, Ohrbach’s closed the Fifth and Broadway store so that the interior could undergo an extensive modernization by architect Welton Becket & Associates. With the $1,000,000 effort completed, the store reopened as Ohrbach’s on November 30, 1953. 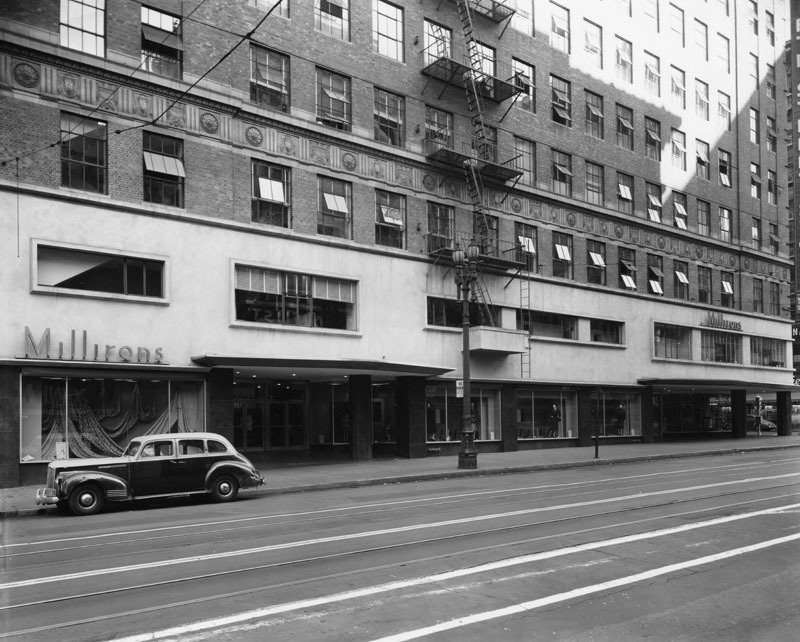 The Fifth Street Store- Walker’s- Fifth Street Store- Milliron’s becomes Ohrbach’s, 11-30-1953. 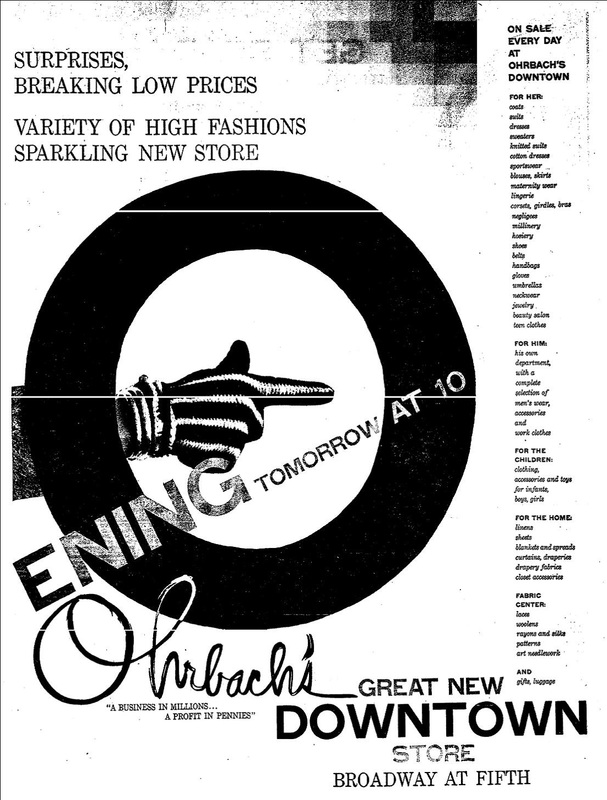 Ohrbach’s sold the Fifth and Broadway location in April 1959. The building was primarily used for office space after that. Top image: Fifth and Broadway c. 1946. LAPL.